Before the first of the brigade's trucks arrived, Raider Soldiers were already learning how to take care of and drive the Army's newest vehicle during Field Level Maintenance and Operator New Equipment Training. Sgt. Brian Wise, from B Company, 1st Battalion, 41st Field Artillery Regiment, was one of the first Soldiers in the brigade to go through the operator training and said he enjoys the new features and capabilities of the JLTV and is looking forward to training the rest of his company. "It will be different for Soldiers, it's something new and unique," said Wise. "I see us getting stuck in the mud way less than we usually do." The JLTV program is a U.S. Army-led, joint modernization program to replace many existing HMMWVs. The JLTV family of vehicles is designed to provide a leap ahead in protection, payload, and performance to meet the warfighters needs. Sgt. 1st Class Randall Archie, the JLTV fielding lead for the 10th Engineer Battalion, said he especially likes being able to adjust the vehicle ride height on the move to adapt to different terrain. Archie was also impressed by the numerous comfort features that make it easier for operators to focus on doing their job. "There is a ton of leg room and head room and it's easier to get in and out of the vehicle," said Archie. "You also don't have to lean forward in the seat when you wear a CamelBak since the seat is designed with a spot cut out for it." A team from Oshkosh Defense has been working with Raider Brigade Soldiers harvesting communication equipment from turn-in vehicles and installing them into the JLTVs. The first six to complete the process were signed over to battalion representatives after the final inventories and paperwork were completed. 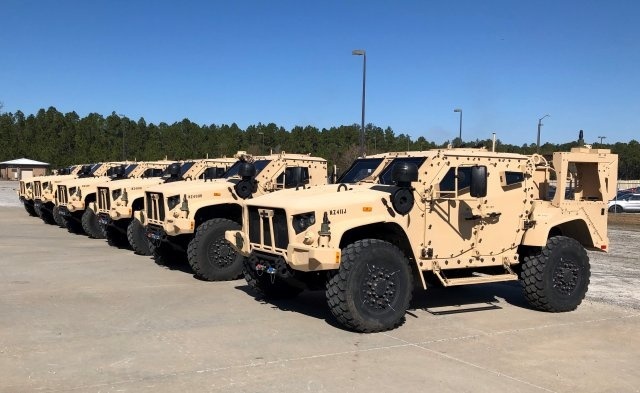 While the fielding will continue through spring, Fullmer said that seeing the first JLTV in the unit's hand was a significant moment that his team has been working towards for quite a while. "We're just so glad we're finally going to have these in the hands of Soldiers so we can improve some of their ability to do their job."